VietNamNet Bridge – Vocational schools all have reported an increasing number of enrollees in recent years. Unemployed university graduates are also going to vocational school. According to Vu Quang Khue, deputy headmaster of the Bac Ninh Industry Junior College, in the past, students only went to vocational schools as a last resort, when they failed the university entrance exams. Some students went to any school they could find just to avoid military service, while others studied at vocational schools while preparing to repeat the university entrance exams next years. If they passed the exams later, they would give up vocational schools to go to university. But things have become different since 2014. “Currently, only 5 percent of our students drop out a year, not two-digit ratios, as seen in previous years,” he said. The vocational school has admitted a student who got 24 for three exam subjects from the national high school finals. With such a good exam result, he would be able to apply for a mid-tier university. However, the student has chosen a vocational school. “Bachelor’s degree graduates also go to vocational schools, because they believe they can find good jobs more easily with vocational school degrees,” he said, adding that polytechnic major graduates are in high demand, especially in precision mechanics, mechatronics, electronics, automation and metal cutting. The workers with these skills can receive VND5-7 million a month at the start, and the salary will be higher when they have more experience. Rector of the Hanoi Tourism Junior College Trinh Cao Khai said after the first enrollment campaign, 2,000 students have started studying at the school, an increase of 10 percent over the previous academic year. Khai said the occupations in the service sector now have big job opportunities. In tourism, tour guides and chefs are in high demand. In order to improve the training quality and help graduates find more job opportunities, the tourism school has signed cooperation agreements with 18 5-star hotels in Hanoi and some other businesses. The students of the college will have opportunities to practice at the hotels to improve their skills. 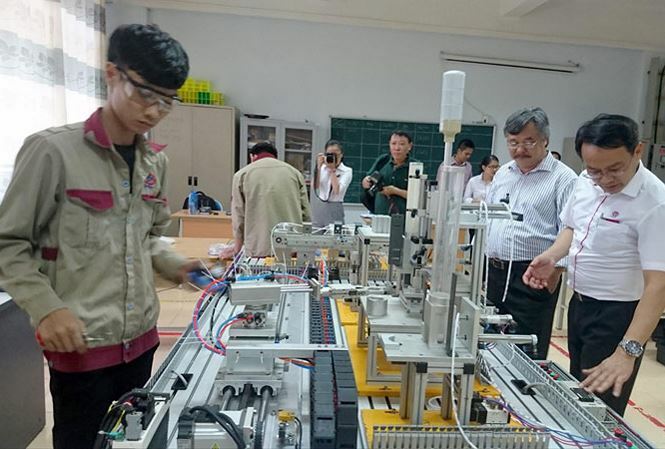 As for the Bac Ninh Industry Junior College, Khue affirmed that the majority of students will find good jobs, adding that the number of graduates every year is high enough to satisfy part of the demand in the locality. Up to 95 percent of students of the school can find jobs immediately. The best students can get jobs several months before graduation. According to Nguyen Thi Lan Huong, former head of the Institute of Labor Science and Social Affairs, 22 percent of Vietnam’s labor force has had formal training. At least 90 percent of them have completed university or higher education levels, and only 10 percent have finished vocational schools.